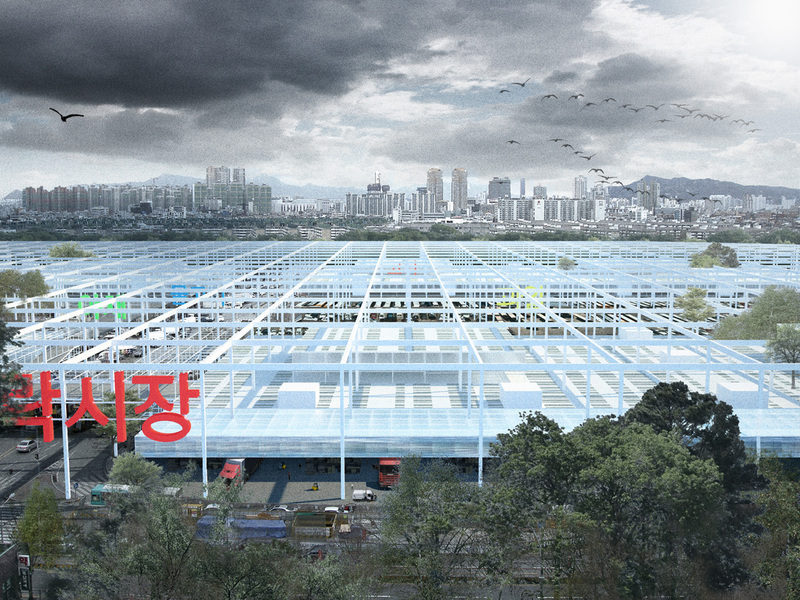 Our design for one of the world’s largest food markets in Seoul Korea proposes more than just a market but also a public amenity enhancing its capabilities as a major attraction. 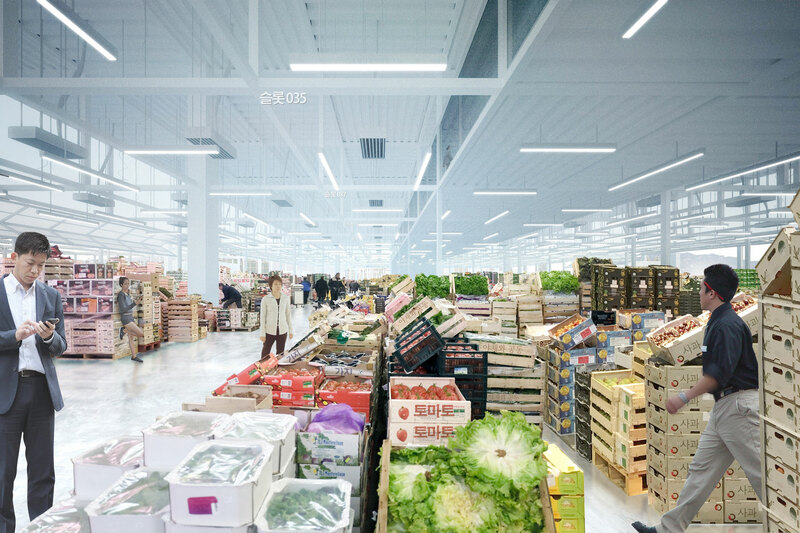 Garak Market opened as the first and largest public wholesale market in Korea in 1985 and since then played a major role in the development of agricultural & marine products distribution in Korea and beyond. A recent fire incident and the general wear throughout the years has rendered the market overdue for an update. Our concept is based on a superstructure, a large infrastructural grid system which unifies the urban master plan of the whole market area. This system can be broken down into entities that fit the turning radii of large size trucks, different transport pallets, and even the smallest entity of various delivery crates. 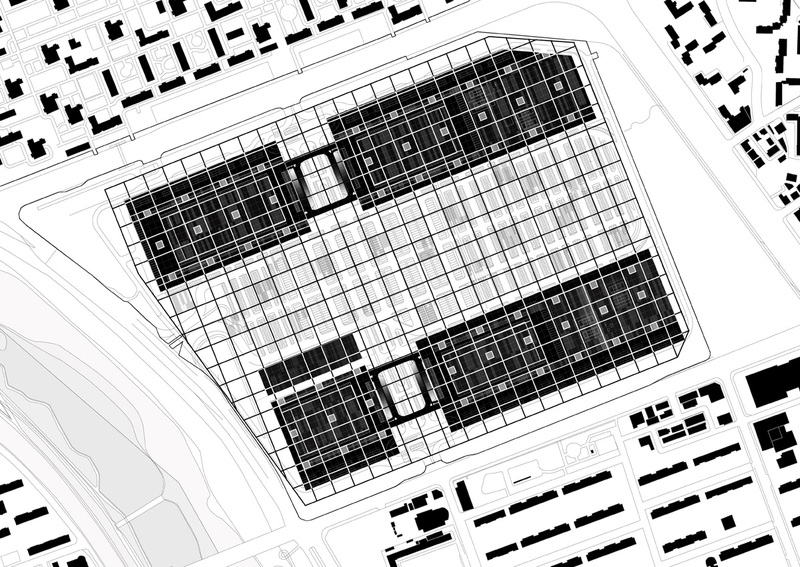 This allows the physical sizes of goods, pallets, moving systems, vehicular requirements, and distribution of shops to serve as the spatial building blocks of the market. The grid system creates a potential for large economic surplus values for market operations through its programmatic flexibility as it allows an infinite number of different market setups while providing the same infrastructural amenities throughout every area of the market. The structure also incorporates green energy systems providing sustainable market operations. Besides its functional dynamism, the larger grid structure also creates a landmark identity for Garak. 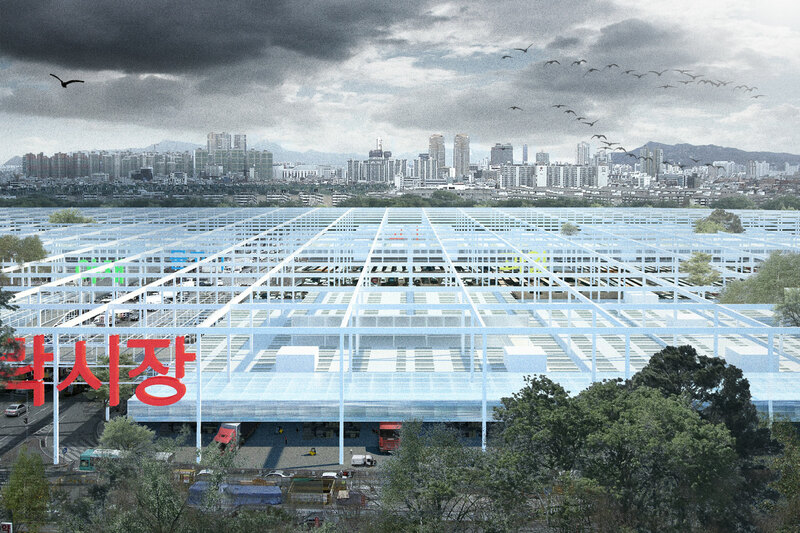 The market is a major attraction for Seoul and beyond it will be even further enhanced through a plug-and-play leisure program of sports fields, outdoor gathering spaces, and elevated parks that will be placed in the large grid of the superstructure to promote community engagement.